The other day I had the chance to listen to Senator Barack Obama on a conference call for American rabbis. The most impressive part of the phone call was not the Democratic Presidential nominee's ten minute talk. Rather, it was a rabbi who spoke on the call before Obama. Rabbi Elliot Dorff (right) of the American Jewish University in Los Angeles spoke beautifully and powerfully about his political views. Rabbi Dorff's latest book has just been published by the Jewish Publication Society. (It seems that he has been publishing books at the rate of Jacob Neusner lately.) This book, For the Love of God and People: A Philosophy of Jewish Law, presents an intelligent and accessible guide to the philosophy that shapes Halakha (Jewish law). While the book is about the Jewish legal system, Dorff also answers the difficult theological questions concerning the relationship of belief in God and the revelation of Torah with observance of Halakha. Amen to that. 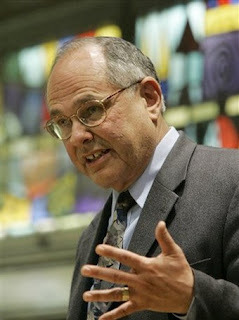 And to Rabbi Elliot Dorff for writing a book that will help so many work through their difficult questions concerning belief and the observance of Jewish law in our modern times.